“Alice Skelton has participated in the Volunteer Income Tax Assistance program for the past five years. In addition to her regular shift each week at our New Horizons Credit Union tax site, Alice participates in our special event where we prepare returns for taxpayers who are deaf with the help of sign language interpreters. In this tax season alone, she has helped more than fifty people with their tax returns, and some of our taxpayers have requested that their appointments be scheduled with her. Thank you, Brad for noticing the great work Alice is doing! We caught up with Alice to ask her a few questions and learn more about what motivates her to be such a great volunteer. UWSWA: Tell us a little bit about yourself. Alice: I am a widow- I have three children and 6 grandchildren. I grew up in Georgiana, Al where I finished school. I have lived in Al, MS, and LA. I love volunteering. I work in my church nursery once a month and deliver meals each week. I am a member of Cottage Hill Baptist Church. I love to work in my yard, read, sew and cross stitch. I also love spending time with my family. UWSWA: What made you want to begin volunteering? Alice: I returned to Mobile after the death of my husband. I worked at H&R Block for 20 years but did not want to return to the work force. I wanted to stay abreast of tax laws and when I found this program, I knew I had found my “fit”. I could stay in the tax business while doing something for someone else. UWSWA: What do you enjoy about volunteering? Alice: I enjoy helping people. I have always loved having one on one contact with people. 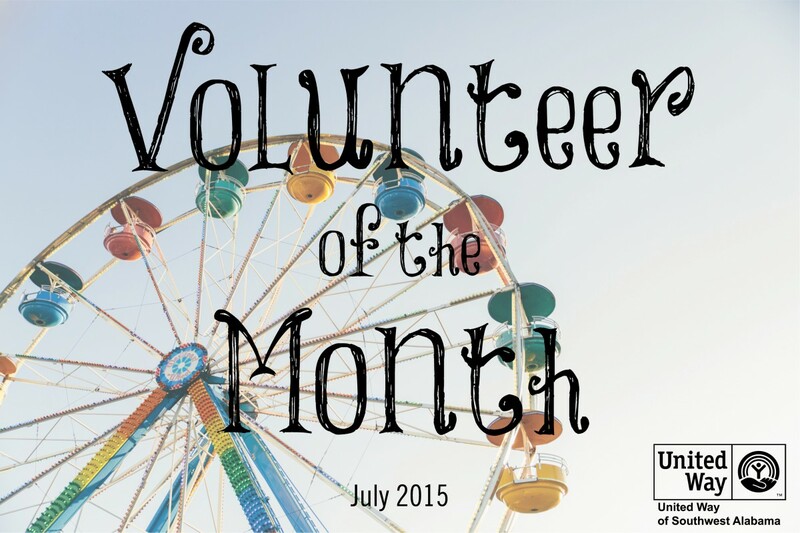 UWSWA: Is there a moment that stands out in your mind about your volunteer experience, as interesting or noteworthy? Alice: I cannot recall a moment in particular but I love seeing the same people year after year and having a working relationship with them. UWSWA: Why would you recommend volunteering to others? Alice: I would highly recommend that anyone get into a volunteer program. There are so many areas to volunteer and there are so many people that need help. Frankly, I cannot imagine life if I could not be of some help to someone outside my family. Alice is truly a great example of what it means to Live United. Thank you, Alice for selflessly giving your time and talents to help others! If you are inspired by Alice’s story and would like to find a volunteer opportunity that is right for you, head over to our Volunteer Connect database and find a community need you can meet. If you are group that is looking for a volunteer activity or project, please contact Kristin Woods.